Checking run capacitors under load is an alternative method to shutting down power to a system and checking in the traditional manner by using the uF (microfarad) setting on your meter. I would always recommend checking capacitors with the power off, from a safety stand point, reaching into a live electrical cabinet compared reaching into a cabinet with no power is always the safer option. But, there are some circumstances where the system may need to continue running during testing, if perhaps the system is serving a critical environment or you are trying to perform a set up of system controls and are unable to kill the power. 1. 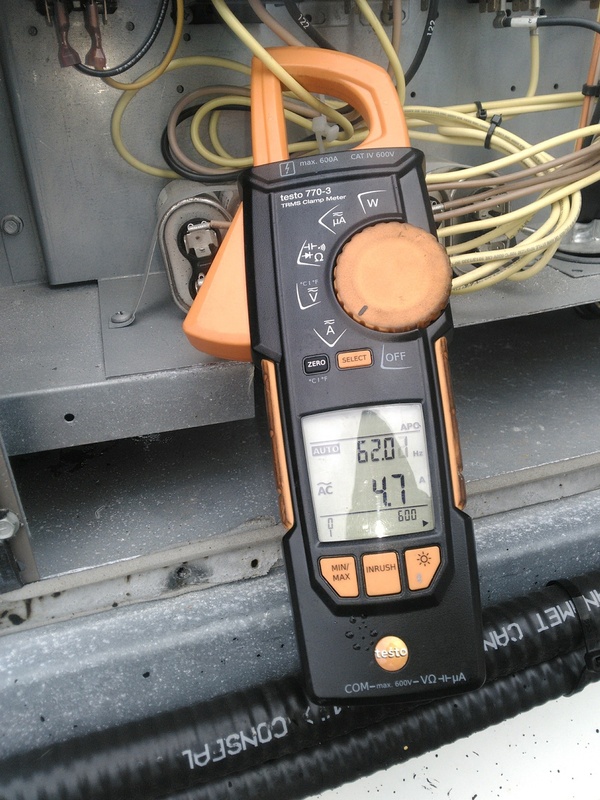 Set your clamp meter to amps and take an amp draw reading of the motor start winding wire connected to the capacitor, note the reading. 2. Now, set your meter to volts and take a reading across the capacitor, that will give you the back electromotive force (EMF) of the motor, note the reading. The above procedure will spit out the microfarad reading under load. Run caps are stamped with a +/- percentage, if your calculation falls within that +/- range, you should be good to go.